Quality comes from prevention and not inspection. Chandra Metal Enterprises is focused on providing superior products and service to the transportation, industrial, and farm sectors. Our mission is to maintain market leadership through quality, innovation, cost efficiency and modern manufacturing technology. Growing from strength to strength Chandra Metal Enterprises image has reached the zenith of stature backed by a great team of Metallurgists, Workers, Engineers, Inspectors and management staff. Chandra Metal Enterprises have a trim & efficient organization of engineers, supervisors & administrators. 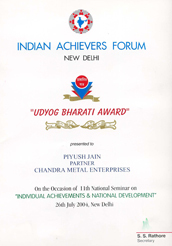 Quality is a way of life at Chandra Metal Enterprises. 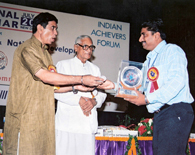 In fact, quality consciousness is ingrained in every aspect of the company. 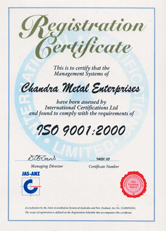 Chandra Metal has well laid out quality systems and procedures fulfilling all the requirements of ISO 9001:2000. The two manufacturing units located at AGRA and DHOLPUR are both certified for ISO 9001/9002 on the basis of each of their activities. At Chandra Metal, paramount importance is given to Quality and therefore the QUALITY ASSURANCE CELL is an integral part of the manufacturing process. In fact the Quality Assurance process starts with the receipt of order when all customer specifications and requirements are carefully studied and process chart is developed. The process control chart developed for the customer is used for the production and strictly audite d by the Quality Assurance at every manufacturing stage. Even on the lookout for better products the product development is a continuous process in our Factory. Using computers and high precision machines intensively for production, planning, designing and research. The special position we holds today in the automotive trade and industry is the direct result of the ability of the company to foresee the challenges of the market place and continuously adapt to new challenges.